I’m not a huge golf fan. It’s genetic. My father, my grandfather, my great-uncle, and many other forbearers were obsessed with the game. And they were all equally-genetically ill-suited for it. My great uncle Tony was a good example. On one particular day at the 18th hole, he knocked one into the water trap. He was so angry about it, he marched down to the water and threw his entire bag of expensive clubs in the drink, then stormed into the clubhouse for some liquid refreshment. His young caddy took off their shoes, socks, and rolled up their knickers, then waded in and fished out the bag and all the clubs. He then dried them off, and brought them into the clubhouse, no doubt expecting a big tip. What I’m sure he didn’t expect was that Tony grabbed the clubs under one arm, the caddy under the other, and then marched down to the water trap, where he threw them both in. Genetically. Ill-suited. So I stay off the links. I get it. Some people are just not cut out for certain activities. And in some games like golf, the rules recognize this. In golf, they have a rule, charmingly called “the Mulligan.” A mulligan is a “do-over.” It’s an informal thing…the pros don’t get to take advantage of it. But if you hit a particularly, spectacularly bad shot, you can call a Mulligan and try it again, without a penalty. Sadly, there’s really no such thing as a Mulligan in politics. So I was thinking, the other day, about Obama’s love of golf, and how it’s become a metaphor for “fiddling whilst Rome burns.” Like Nero of the Roman Empire, Obama seems to have an unlimited capacity to ignore problems and simply head out to a handy course for a couple of rounds. Remember the thing last week, where that crazed nut-job walked into a black church and mowed people down with a handgun? 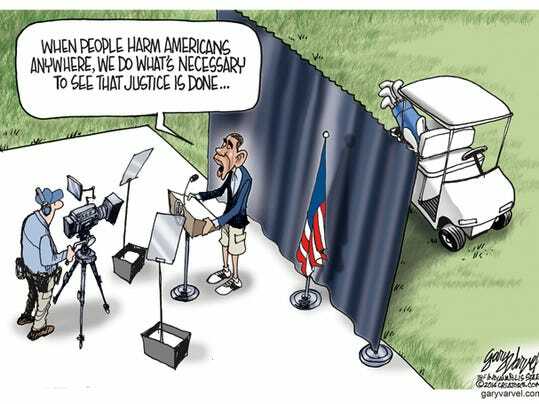 Obama was soooooo concerned with that tragedy that he gave a speech blaming the gun (kind of like blaming a hammer when your thumb gets hit), and jetted off to California to play some golf. I have no idea who will win the Presidency in 2016. Conventional wisdom says it will be a Republican. The media tells us Hillary is a lock. Me? I dunno. My crystal ball has a bad case of cataracts. But whoever wins, I hope that their first official act is to declare the last administration one big Mulligan, and pass some overarching law that will repeal, overturn and reverse most of what Obama’s done. Let’s call it a “do-over” and return to, oh…I dunno…actually observing laws that are Constitutional, shall we?